Soft tissue and bony defects of the lower extremity can be a source of considerable morbidity, often requiring amputation of the limb. Such defects can occur with trauma or as a result of chronic medical conditions such as peripheral arterial disease and diabetes. The goal of lower extremity reconstructive surgery is to replace injured or nonviable soft tissue and bone in an effort to salvage an otherwise injured or diseased limb. The lower limb has two main purposes: 1. Static support of the trunk while standing, and 2. Ambulation. The goals of lower extremity reconstruction are to maintain those capabilities following injury, medical illness, or as a complication from a surgical procedure. Some common indications for lower extremity reconstruction include: extensive soft tissue and bony injury due to trauma, chronic wounds secondary to diabetes or arterial insufficiency, exposure of underlying prosthetic joints following hip or knee replacements, and exposure of grafts involved with improving lower leg circulation. Wounds involving more extensive soft tissue defects can be treated with a special wound dressing called a Wound VAC (Vacuum-Assisted Closure). The treatment of lower leg wounds is dependent on the extent of the wounds and their location on the leg. 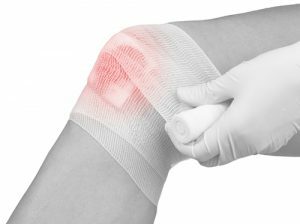 Superficial wounds involving only soft tissue can often heal with a variety of wound dressings. The dressings should be matched to suit the characteristics of the wound being treated (e.g. Does the wound drain considerably or is it relatively dry?). Often, management of these wounds can be coordinated with care at a hospital-based wound care center. A wound VAC dressing consists of a porous sponge-like material that can fill a wound cavity and that is then held in place with a transparent film dressing with suction tubing attached. Negative pressure is then applied to the suction tubing. This pressure then removes excess wound fluid, stimulates wound healing biology, and improves blood flow to the wound. These effects combine to facilitate healing of a wound, while minimizing the risk of infection. The wound VAC has become a very useful component in the treatment of large leg wounds. Often, the wound VAC can serve as a bridge to a more definitive wound closure, such as the placement of a skin graft or flap. In wounds in which there is exposure of underlying bones or joints, wound closure typically requires the movement of skin and possibly muscle into the area to restore the lost tissues. The location of the wound dictates the various skin or muscles that are available for wound closure. In wounds of the thigh or knee, adjacent muscles can be utilized for wound closure. Wounds of the ankle and foot usually require tissue flap coverage involving microsurgical techniques. Once a leg wound has been closed, the rehabilitation process can begin. This usually involves intense physical therapy to recondition the muscles, improve stability with standing, and address joint stiffness from inactivity. Despite aggressive surgical treatment of wound or bone infection and attempted wound closure, some wounds are not amenable to or fail reconstruction. In these cases, amputation may be required. The level of amputation necessary will be determined by the amount of tissue that must be removed to provide a closed wound and the best level that will support the use of leg prosthesis for walking. Determination of these factors is usually made in conjunction with the advice of other surgeons, such as orthopedic and/or vascular surgeons. If you would like more information on the lower extremity reconstruction process, or would like to set up a consultation, please contact us today.